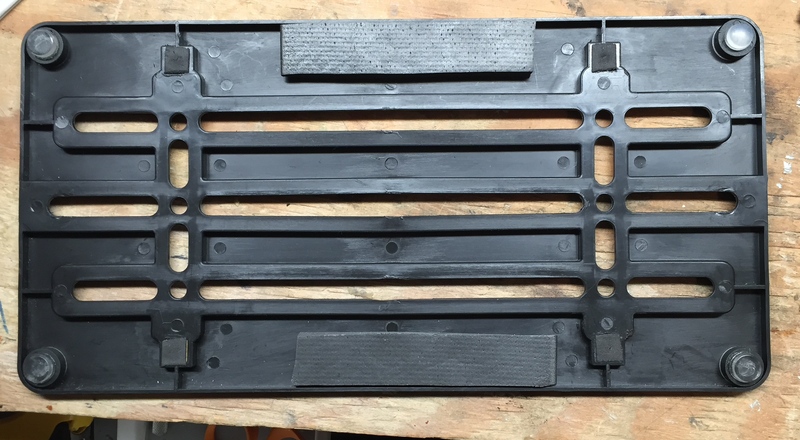 I discovered that my stock plate holder was broken and would no longer hold the nuts in place...I needed to find a new one. 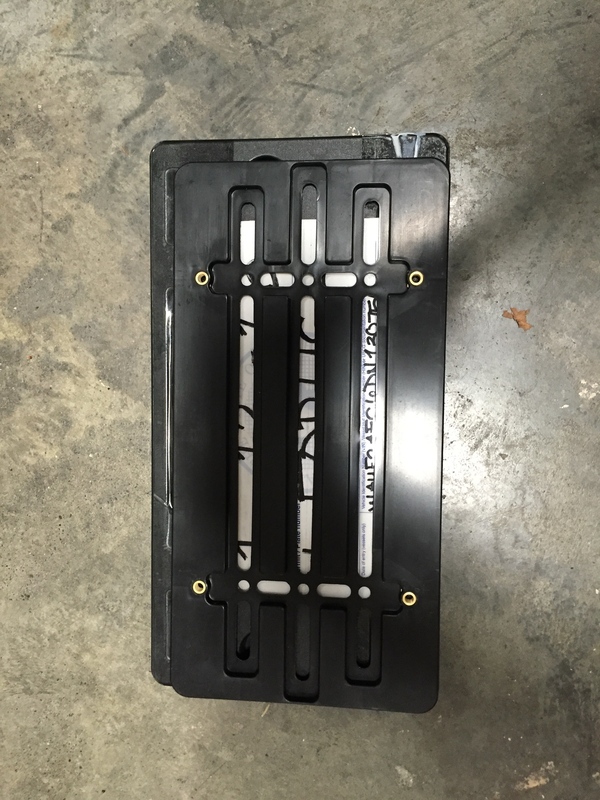 OEM or audiparts online wanted $95-$112, so I said forget that and hunted down a cheaper version. Enter a $10 holder off of ebay. Can't find the direct link anymore, but very similar to this one. 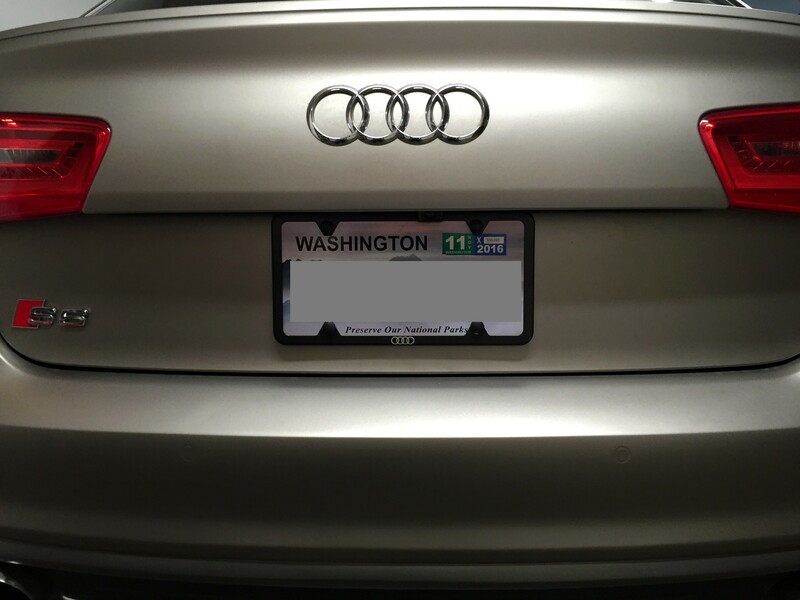 As a bonus, this one also was the proper size to hold the license plate and frame, vs the OEM one. 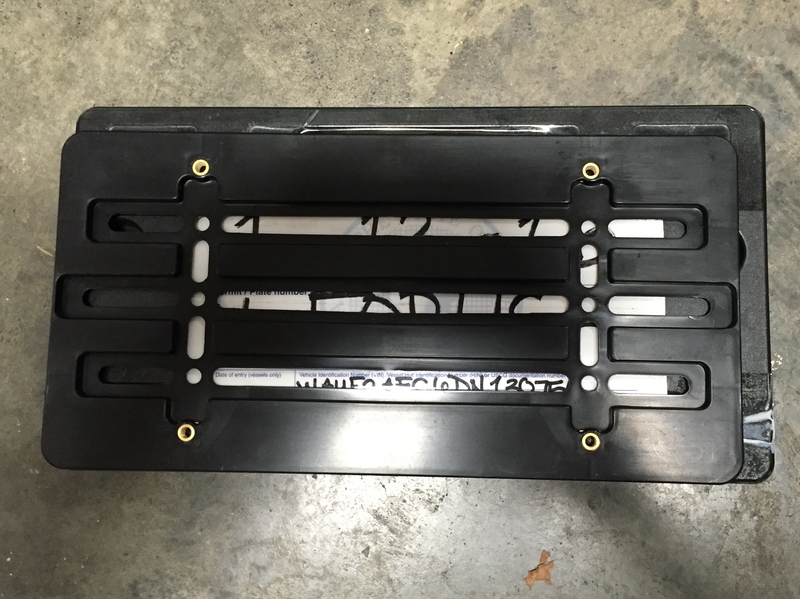 The OEM one is bigger and always resulted in a rattle due to the plate cover not being able to fully surround it. Below you can see the OEM compared with the smaller Ebay one on top. 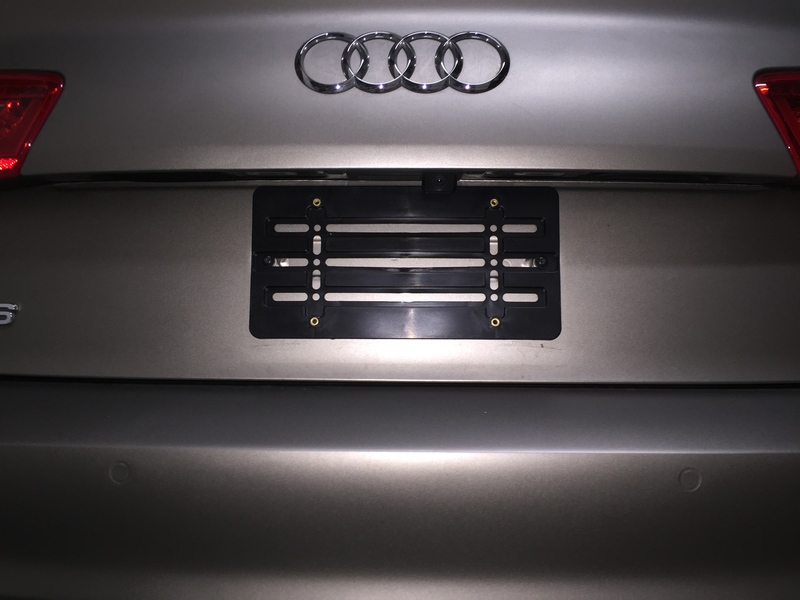 To make sure it doesn't rattle, I used the included spacers from the Audi license plate frame on the back corners (black in the below), added some softer pads on top of those (clear in the below, meant for dampening drawers), and also added longer soft rubber strips in the middle (basically mouse pad material). I essentially just grabbed what I had laying around the house to try and make sure we'd be in a rattle free zone here. 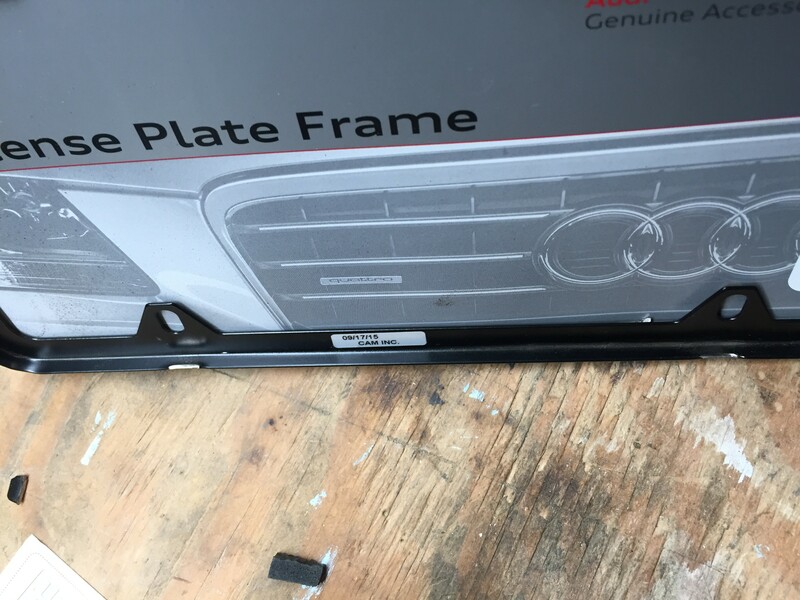 I then took the Audi license plate frame I got from ECS and dremel'ed off the two tabs on the back, so that it could completely wrap around the plate and plate holder (photo on right). After I took that pic, I also gave it a couple of sprays of paint to prevent rust. Note, in order to get the plate holder to fit onto the plate bracket, I had to widen the holes in the plate holder just a tiny bit, otherwise I couldn't quite get the screws to go in on all four. About 1-2mm on the top two is all it took, and I just did that working the drill a bit side to side. ​Finished product below, and I'm happy to report it's rattle free.